On October 25, 2000, the Center for International Policy held a conference on the prospects of agricultural trade between the United States and Cuba now that a limited exception for food and medicine has been made in the U.S. embargo. Conference participants noted that American farmers needed new markets. They could sell an estimated $400 to $600 million to Cuba almost immediately if unrestricted sales were allowed, and $1 billion in five years. Beyond the market imperative, a number of participants also said that the United States should long ago have removed food and medicine from the embargo to be consistent with international law. Conferees noted that it was fully expected that Congress would pass legislation last year to allow the sale of food and medicine to Cuba, Libya, the Sudan, Iran and North Korea. Polls indicated American public opinion to favor it and there was clearly a bipartisan majority in both houses for it. An amendment offered by Rep. George Nethercutt (R-Wash.) to the agricultural-appropriations bill was the vehicle. Unfortunately, as conference participants noted, the Republican leadership in the House backed by the Cuban-American representatives from Florida and New Jersey once again blocked the Cuban market to U.S. farmers. Though not tampering with the amendment's provisions to sell food to the other four countries, the leadership got restrictions attached to Cuba sales prohibiting not only U.S. government trade credits but even private U.S. bank credit. Even worse, they attached a wholly-unrelated tightening of travel controls, making it less likely that U.S. citizens will be able to travel freely to Cuba in the near future. While there was consensus at the conference that the thus-modified Nethercutt amendment was less than hoped for, those representing agricultural interests tended to see it as a welcome step forward, noting that it opened the way to sales to the other four countries--including the important Iranian market--and did not rule out sales to Cuba, provided they were financed by third-country banks. Cuban representatives at the conference, however, said their government viewed the restrictions as insulting and discriminatory and would not enter into any commercial transactions under these terms. Most American participants whose focus was U.S.-Cuban relations rather than agriculture saw the codification of travel controls as too high a price to pay for an elusive gain on trade. Whether reacting critically or positively to the Nethercutt amendment as enacted, many American participants believed that an all-out effort should be made in the next Congress to remove the restrictions on U.S. bank credits and to reverse the codification of travel controls or lift them altogether. There was also general consensus that trade worked best when it was two-way and the United States should not only export but also begin importing from Cuba. Before 1959, Cuba and the United States were important trading partners. William Messina, Jr. is executive coordinator of the International Agricultural Trade and Development Center of the University of Florida. He noted that Cuba had been the United States' sixth-largest export market, with the United States supplying 70 percent of Cuba's imports, some 25 percent of which were agricultural commodities, including rice, beans, beef and dairy products. The United States in turn was Cuba's principal market and more than 90 percent of Cuban exports to the United States were agricultural commodities, led by sugar, tobacco, tropical fruits and winter vegetables. That this trade was mutually beneficial was undisputed by conference participants, and much of it could be restored along earlier lines. It would still be advantageous to Cuba to buy rice, beans and dairy products from the United States and Cuba would also be interested in wheat and poultry products. The United States still wanted to buy fine Cuban tobacco and some tropical fruits and possibly winter vegetables. As the nature of the world sugar market had changed, the United States would no longer need large quantities of Cuban sugar but could buy lesser amounts for refining, and there are now other products of possible interest, such as shellfish, citrus, and alcohol. In short, what was once an important trading relationship could easily become so again to the benefit of both countries. Dennis DeLaugher, president of the U.S. Rice Producers' Association, began the panel discussion with an analogy--when a piece of farming equipment sits unused for a long time, a lot of grease is needed to get it going again. He explained that while the recent action in Congress to allow for the restricted sale of food and medicine to Cuba was not as big a grease gun as U.S. farmers had hoped for this year, they would use it nonetheless. According to DeLaugher, the market for rice in Cuba matched the production of rice in the state of Texas--it was a large market. For that reason, the growers and producers that he represented would continue to fight for a further opening in the Cuban market. Gustavo Machin of the Cuban Interests Section agreed with his American counterparts that Cuba was a natural market for United States agricultural products, because of proximity, past trading relations and interest in one another's products. He said that after the fall of the Soviet Union in 1991, the Cuban government was forced to diversify its pool of trading partners and suppliers. Today, the most important Cuban trading partners were Europe, Canada, and Latin America. The Cuban government currently imported $1.4 billion in foodstuffs annually, a number that was constantly increasing as the economy grew and more food was needed for citizens and tourists alike. Like any government, Machin said, Cuba's was always looking for better trade conditions, lower prices and the highest-quality product for its money. Currently the Cuban government got the majority of its rice from Vietnam, China and Thailand. Due to the long distances involved, the Cuba spent 30 percent more in freight costs and deliveries took more than fifty days. By contrast, a ship from New Orleans could cover the 599 nautical miles' distance to Havana in four days. Shipping time and costs were important factors for the Cubans. Machin said, however, that despite the advantage of proximity and even recognizing the efforts expended by allies in Congress on the legislation, the restrictions were humiliating and impossible for the Cuban government to accept and there would be no commercial engagements. Paula Stern is former chairwoman of the International Trade Commission and now head of the of the Stern Group, Inc. She said that the impact on the U.S. economy from trade with Cuba would be small but beneficial. She noted the steady increase in Cuban imports from the West since the fall of the Soviet Union and explained that even a partial lifting of the embargo on food and medicine could allow for more than $400 million in U.S. exports after a period of five years, and nearly six thousand associated jobs. Stern's projections matched those of the U.S. Department of Agriculture in August 2000. The USDA estimated that food and agricultural entities in the United States could expect $300 to $500 million in annual sales to Cuba. Stern's figures under partial lifting were predicated on access to U.S. financing and agricultural credits. She noted that under the final legislation with its restrictions on U.S. financing, the anticipated $400 million in exports would be reduced significantly. Finally, she said, with the Cubans unwilling to negotiate deals under the recently passed legislation, the amount of U.S. agricultural exports to Cuba dropped to zero. Apart from these economic calculations, Stern noted, political considerations ruled. Political factors on both sides, the United States and Cuba, would dictate the speed and extent of economic benefits. These political factors were two: 1) the extent of U.S. official action liberalizing the embargo and 2) the degree of domestic liberalization and reform in Cuba's planned economy permitted by the Cuban government. She saw a number of additional impediments to U.S.-Cuba trade. For example, Cuban authorities might try to avoid the risk of relying on any one supplier for the majority of their imports--in particular, food--after having been burned twice in the past, first by the original U.S. embargo and second by the devastating withdrawal of the Soviet Union. According to Stern, the prospect of partial U.S. trade liberalization with Cuba marked an important political step as well as an economic opportunity. However, she cautioned that this opportunity for American farmers and business was also a threat to the Cuban status quo and the Cuban government's control. Paul Drazek was formerly assistant secretary of agriculture for international affairs and is currently a trade consultant to DTB Associates. He noted that even if the United States completely lifted the embargo, trade would not be completely free as both countries would likely impose tariffs. There would then be a need for a free-trade agreement which would be more difficult to reach. Drazek noted that in May 1998, Cuba celebrated its fiftieth anniversary as a founding member of GATT and a member of the World Trade Organization. He noted that at a recent U.N. meeting in New York Fidel Castro received a standing ovation. This underlined the lack of support for the embargo. It was seen that Castro had stood up to the United States and not that the United States stood up to him. The conference noted that the United States could learn from the creative financing options the Europeans have used to channel Cuban business to their farmers. In some cases the Cubans have paid in cash, but regardless of the method of payment, Cuba was allowed to negotiate terms. For example, the French government helped its producers underwrite trading costs with Cuba. Cuba was treated with respect and allowed to make its share of the decisions, and both trading partners gained confidence in one another. Even though the Cubans paid more in freight, they were comfortable doing business on these terms with partners who had proved reliable. When asked what steps the rice industry might take to get Congress to pass more meaningful legislation in 2001, DeLaugher explained that his organization was assembling a test financing package to show how trade was still hampered under the new legislation. He explained that the best way to persuade Congress was to show legislators that nothing would get done under the current law. The overwhelming conclusion of the panel on Congress was that strong bipartisan support existed in both houses for lifting all sanctions on the sales of food and medicine. Panelists agreed that the measures achieved in the agricultural-appropriations bill were only a foot in the door--a jumping-off point for a more thorough and meaningful change in policy in 2001. In 2000 the Senate Agriculture Committee voted overwhelmingly to end the restrictions and in late June the House voted 301-116 to prevent the use of Treasury funds to enforce the existing food-and-medicine sanctions. Brian Moran, senior legislative assistant to Sen. Byron L. Dorgan (D-N.D.), explained what happened next. Clearly, there were enough votes to ease the sanctions. But action would follow no textbook pattern but would be influenced by election-year politics. Everyone running for reelection needed to be able to show victories on important issues. Thus both supporters and opponents of sanctions were under great pressure to accept a compromise lifting sanctions on other countries but effectively leaving them on Cuba. These election-year politics explained how an amendment originally benefitting both Cuba and U.S. farmers ended up benefitting no one except House leaders and three Cuban-American members. When Representative Nethercutt came forward with an amendment that was sure to benefit his constituents and other agricultural interests, the Republican leadership cut a deal with him making him look like a hero in his district while preventing a true opening to Cuba, indeed tightening the current embargo by codifying the existing travel restrictions. By changing the original financing provisions in Nethercutt's amendment and by tightening the travel restrictions, the Republican leadership effectively redefined the issue. No longer was it whether to lift all food and medicine sanctions, which clear majorities in both Houses supported. Now it was whether to tighten travel while lifting sanctions on everyone except Cuba. This tactic split the agricultural community away from humanitarian and public-interest groups which opposed sanctions on Cuba. Nethercutt's legislative assistant Rob Neal noted that the debate was about more than Cuba. He reported that his boss and others were confronted early on with the question of whether to keep Cuba in the legislation at all. They could have excluded Cuba altogether and seen their bill move quickly through both houses. However, they kept Cuba in and as a result, beginning on February 28, 2001 sales of food and medicine to Cuba would be legal. As to the legislation's inadequacies, Neal stated simply, "Don't move the goalposts." Fifteen months ago no one would have guessed how far this issue could come in an election year. After last year's maneuvers by the leadership it was clear that any attempt to move the issue forward would require a better effort in lining up members. To spearhead this effort, in November 1999, 220 House Republicans and Democrats signed a letter to Speaker J. Dennis Hastert (R-Ill.) calling for meaningful change in U.S. sanctions policy in the year 2000. Other necessary steps were taken, such as scaling back the proposal put forward by Sen. John Ashcroft and creating a congressional force strong enough to ensure that the leadership would have to accept some combination of the previous year's proposal. According to Neal, they were successful - after all, they succeeded in not allowing the Nethercutt amendment to be wiped out all together, which looked like a real possibility in early summer of 2000. What was significant was that Cuba was kept in the bill. While the current legislation might not change much on the ground, in looking ahead to next year Neal could say, "Now we at least have a foot in the door." In the opinion of Pete Kasperowicz, founder and editor of Cuba Trader, Nethercutt's compromise with the Republican leadership was excessive. With no government or private financing allowed and travel restrictions increased, this was no opening at all. Under these restrictions one must forget about selling to a Cuban government entity altogether and find a private person with a lot of cash. It was claimed by some that the new legislation waived the Helms-Burton Act restriction that prevents U.S. ships that have called on Cuban ports from reentering the United States for 180 days. In fact it did not, Kasperowicz noted. This issue was, however, dealt with in the Cuban Democracy Act, which said that exceptions to this law might be made in the case of special licenses. And the Office of Foreign Assets Control had indicated that it would waive this restriction for U.S. companies exporting food and medicine to Cuba under the new legislation. Kasperowicz noted that both Senator Ashcroft and Representative Nethercutt were motivated by electoral considerations. The ironic part, he said, was that in reading the bill that emerged one struggled to find any real champions on the issue. Not much would come of it at all. As noted during the panel discussion the Cuban-American representatives from Florida and New Jersey were hyper-active during the entire negotiating period. The Republican party was divided. The farmers and free traders did not agree with the Cold War tactics of the leadership and Cuban-American members. Robert Muse, in one final comment, criticized Nethercutt and his staff for having gone behind closed doors with the leadership to appease three House members, in the process negotiating away one of the most fundamental human rights, that of travel. This he found to be a pathetic tradeoff for a piece of legislation that would do nothing to help Cubans or U.S. farmers. "Good Business and Morally Right"
Keynote speaker Jack Laurie, vice-president of the American Farm Bureau Federation, recalled that he had visited Cuba in 1999 as part of an agricultural fact-finding delegation led by the Center for International Policy and had seen a country with many problems and with policies that many Americans would find objectionable. But he had also seen a country striving to revamp its economy and in need of agricultural products the United States could supply. It was an important potential market for American farm products. Laurie had no magic solution to Cuba's dilemma, but saw only good for both sides in reforming the forty-year-old U.S. trade embargo. "Opening the door to trade relations with our neighbor is not just good business, it is morally and ethically right," he said. "Trade involves far more than moving goods and services. The flow of ideas and values also occurs. Cooperation and respect should dictate our actions, not misguided government decrees." "The continuation of sanctions on food and medicine hurts only defenseless people, not their governments. When food is used as a weapon the ones most hurt are the U.S. farmers and the consumers in those countries targeted by our sanctions . . .Worst of all, America gains the reputation of being a bully, keeping food and medicine away from hungry and sick children; this is totally inconsistent with our country's tradition of compassion for others." Laurie called the recent congressional action an important first step, but stressed the need for more. If markets were to be opened for American farm products, U.S. government export assistance should be allowed for all countries, Cuba included. Laurie called on all to redouble their efforts to bring about the unfettered sale of U.S. agricultural products to Cuba. In the year since the American Farm Bureau Federation began its campaign to open the Cuban market, "We've seen a sea change in U.S. policy toward Cuba and achieved an opening to North Korea, Libya, the Sudan and Iran. This puts us closer to our ultimate goal of total sanctions reform." While calling on Americans to press ahead to lift all sanctions and permit U.S. financing, both government and private, of sales to Cuba, Laurie also called on Cuba to take a more positive view of what was accomplished and perhaps even to test the legislation by attempting a few purchases. "We've made a good beginning, " he concluded, "but much remains to be done." Alejandro Gutierrez Madrigal, president of Cubazucar, Havana, saw sugar as an integral part of Cuban history, still the island's principal export. After some difficult years following the collapse of the Soviet Union, the Cuban sugar industry was beginning to recover. Pesticides, fertilizers and many other inputs for a high-yield crop remained in short supply, but Cuba was maximizing what it had. Its aim was not to vastly increase production, rather to produce a high-grade product on a cost-effective basis. It was also concentrating on deriving maximum benefits from sugar by-products. It was not yet possible, Gutierrez said, for Cuba to revive in even small quantities its historic sugar trade with the United States. Many barriers remained on the U.S. side and the recent action of the Republican leadership bode ill for the early elimination of these barriers. Still, inevitably, the embargo would be lifted and two-way trade resumed, with sugar a part of it. Tom Earley is executive vice-president of Promar International and former staff economist on the president's Council of Economic Advisers. Despite its problems, he noted, Cuba was exporting some $300 million in agricultural products besides sugar each year, principally tobacco, rum, seafood, fruits and winter vegetables. He saw no reason why Cuba could not dramatically expand these exports, but to increase production it needed more fertilizers, insecticides and other inputs requiring capital investment. Furthermore, Cuba needed to upgrade support facilities such as cold storage and packaging, which would also require capital. Joint ventures had already begun with considerable foreign investment from many countries, excluding the United States. When the time came, Americans would doubtless be interested as well. Robert Muse, an attorney with Muse and Associates, stressed that so long as the Helms-Burton Act was on the books, it would be difficult to import any products from Cuba, agricultural or otherwise, as those U.S. citizens and companies who lost properties in Cuba could argue that the product was produced on land that previously belonged to them and thus take the importer to U.S. federal court on charges of trafficking in their lost property. Muse pointed out that a dozen other reasons existed why two-way trade would be nearly impossible until the Helms-Burton Act was rescinded. Looking toward the day when it was and normal trade resumed, it was important that the property-claims issue be resolved, Muse noted. The only claims the U.S. government had some legal responsibility for were those of U.S. citizens whose properties were nationalized and who were citizens at the time. Under international law, the U.S. government had no responsibility for the claims of those who were not then U.S. citizens--for example, the Cuban-American claims. Wayne Smith added that Cuba had from the beginning recognized its obligation to compensate American owners for their nationalized properties. It had offered a formula for compensation at the time the properties were taken, but the United States, rightly he believed, had rejected it as insufficient. The matter was raised again in 1977 when the United States and Cuba opened interests sections in each other's capitals and resumed direct communication. Cuba reached compensation agreements with every other state with claims against it. In 1977, and periodically after that, it indicated its willingness to work out an agreement with the United States. The United States was unwilling to enter into such negotiations, however, because it was fearful that this would be interpreted as a long step toward normalization, a step it was unwilling to take. Muse said that despite the restrictions imposed in the Nethercutt amendment, the president retained the right to license the sale of food and medicine to Cuba if he so chose. The Helms-Burton Act codified the embargo in its entirety, but that meant that it also put in law the president's authority to issue such licenses. 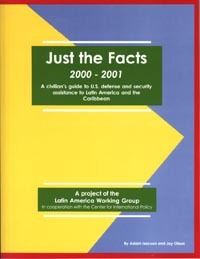 A civilian's guide to U.S. defense and security assistance to Latin America and the Caribbean. Presents the most exhaustive database available anywhere of U.S. defense and security assistance to the hemisphere. Just the Facts is the product of a collaboration with the Latin America Working Group, a Washington-based coalition of sixty nongovernmental organizations. The book includes arms transfers, training programs, exercises, counternarcotics, bases, and other activities. © 2001 by the Center for International Policy. All rights reserved. Any material herein may be quoted without permission, with credit to the Center for International Policy. The Center is a nonprofit educational organization focusing on U.S. policy toward the developing world and its impact on human rights and needs. q Please send me more information about the Center for International Policy. Donald Soldini, International Preferred Enterprises, Inc.